Earlier today, Sean the Storyteller from Capital Yarns asked if I would like to participate in a blog hop. “Yes, please,” was my answer, without owning up that I didn’t really know what a blog hop was. But I couldn’t resist the opportunity to write about the topic of ‘Why I Write’. Last week marked the fourth anniversary of my blogging journey. My first efforts were overly wordy, disorganised and crudely structured. Yet somehow I have felt driven to keep going. Sometimes I fret that no-one reads what I write; othertimes I worry that I have shared too much of myself, or made a mess of things, and hope no-one will read. But I keep going stubbonly and resolutely forward. This blog hop was started by Josefa from Always Josefa, who began the theme: ‘Why Do I Write’? Several of my Canberra blogging friends have participated, including Mummy Blogger Nadia of City Mum ~ Rural Life, Michelle from Dory the Explorer (a talented photographer with great tips on how to holiday on the cheap), before the baton was passed to me by Sean, who wrote an innovative and touching response (he must be one of the best Dads ever). Hmmm, I am not sure that I really fit into a genre. I have two blogs: www.taiwanxifu.com and this one (www.weekendparent.co). I write about parenting, but am not really a Mummy blogger as such. I write a lot about food (reviews and restaurants), but am not exclusively a food blogger. I write about frugality, but I am not a personal finance blogger. I write about travel, but am not really a travel blogger. I write about cultural issues, but I am not really an anthropologist or socielogist. I write about Chinese post-partum confinement (zuo yuezi), but I am not a doula, midwife or postnatal expert. Well, I guess I am a blogger and the thing I love about blogging is the freedom to choose what I write about. I have a day job where I have to write in a concise, pragmatic, impartial, and balanced style. I understand the importance of crafting nuanced reports in a set style and layout, but I totally love the freedom of being about to write whatever I want to in my spare time. If I had to sum up my genre, I would call myself a lifestyle blogger. I write. I try not to think too deeply about my writing process, and instead focus on actually writing. As in just typing. I don’t have much spare time and almost all of my spare time is set aside for blogging. I am a mother of two young, active boys. I work full-time in a career that I love, have a passion for cooking and keeping my house looking (mostly) neat and clean, always read bedtime stories with my boys, and therefore I don’t even begin to start writing until the kids get to sleep. I aim to start writing by 9.00pm, but often it is later than that. Some nights I am exhausted and crash in bed early. Then I emerge refreshed and full of ideas for my next blogging/writing session. With such limited time for writing, I never have writer’s block. I have a seemingly endless list of blog posts that I want to write about. I usually keep a scrawled list next to my computer, which I will often willfully ignore and work on something completely unrelated. Or get sidetracked by Facebook, Instagram, Twitter or other people’s blog posts. But mostly I am disciplined, and force myself to write something, anything to get the inspiration going. I touch type so I let my fingers flow and ususally I will get in the zone. I re-edit and fix typos later. Why do you breathe? Sometimes I have things in my head, ideas that swirl around and I am not happy until I get them into words. They just need to get out. I get a bit antsy if I have gone for several days without writing. This makes me sound like a nutter, and maybe I am a little unhinged. My life would certainly be much easier and I would have more time to myself if I was not addicted to writing. But would I be me? I am who I am, and for better or worse I am a writer. I was posted to Taiwan when baby had just turned nine months old. Taiwan is (in my view) a magical and misunderstood place, and wanted to do share with others the things about Taiwan that I liked so much. Many people think it is either ‘Thailand’, or a dangerous place that China is about to invade. Taiwanxifu started as food/travel blog, but over time it became more focused on cultural issues. I realised as my writer progressed that my life purpose is to be a bridge between cultures, especially Western and Chinese/Taiwanese cultures. 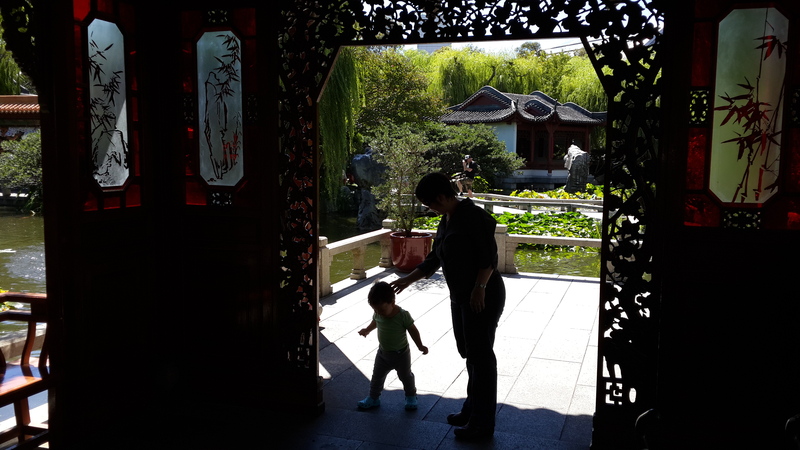 When I had baby number two in Taipei, I underwent Chinese postpartum confinement (zuo yuezi) and I blogged throughout that. I started Weekendparent as a platform to talk about parenting issues that didn’t fit within the Taiwan lens. As a full-time career mum, I often felt this sense of disconnect when I looked after the kids on the weekend. I would tell them not to play with something or do something, only to find out that during the week they were allowed to. Or I would give them more liberty than they were used to, and they would go a bit wild and then not listen to me when I told them to stop. I didn’t have the type of easy connection with them that I would like. I felt guilty that I must be a bad parent: surely other parents didn’t have these type of problems getting their kids to behave? My first blog post was typed in frustration late one night after my preschooler would not go to sleep, after which I was so worked up that I couldn’t go to sleep myself. Since relocating to Canberra, the focus of Weekendparent has shifted. I have been selected as one of the 101 Local Humans in VisitCanberra’s campaign, so I use this platform to write about family fun places. And I enjoy our family-friendly, easy lifestyle here in Canberra and consider myself blessed to live here. I am also focusing more on frugality, especially in the kitchen, and this is reflected in an article I recently had published in The Canberra Times and frugal recipes. My Zuo yuezi experience: the book. Thinking about how best to turn blog posts into a more structured and engaging narrative. Non-fiction prose is different to blogging. An account of a trip to the Olio Mio olive grove at Captain’s Flat (near Canberra) run by a Taiwanese couple. Their determination to do something absolutely crazy is infectious. Fantastic, high grade olive oil in an impossibly remote setting. An intro to a book by my friend Ivy from Ivy’s Kitchen. I am featured in one of the chapters, and also write a preface. Sharing my recipe for chocolate oat slice. The recipe was given to me by a Taiwanese/American friend, and I always make it for birthdays and special occasions. It might be less flashy to look at than say a chocolate fudge cake, but oh my this is comfort food to die for. I always naughtily sneakily steal more bites from the freezer. I am not passing on the blog hop to other talented writers. Firstly, my good friend Trish from We Love Retirement. Reading her blog about her time on Deal Island (her and hubby were caretakers for several months on a lighthouse island in the Bass Strait) was one of the key inspiration for me to start blogging. Trish and husband Bob travel to the most amazing places, in frugal and innovative ways, and are truly loving their grey nomad life. They are currently on a two year trip. Secondly, a shout-out to Katrina, a good friend and Taipei/New Zealand blogger who is also a talented writer, poet and educator. Her new writing website is beautiful. And finally, to Peggy, a Hong Kong friend who I met in Taiwan (and who also has a Canberra connection — it is a small world). She has a Chinese language blog about parenting (我的魔羯座小王子和天蠍座小小王子), which you can checkout on her Facebook page. A lovely post about your writing. I’m looking forward to your book on zuo yuezi — you’ve written so many fascinating pieces on it.